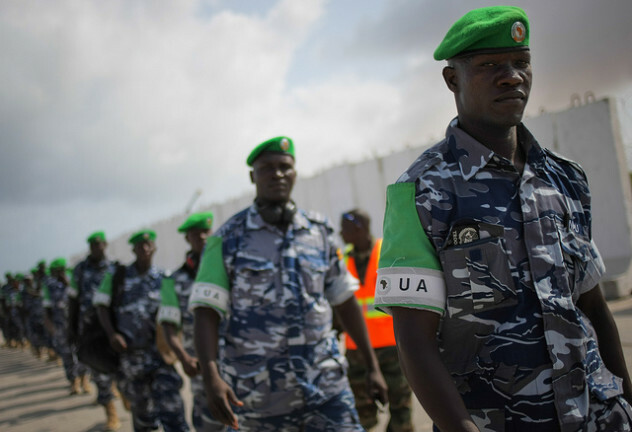 MOGADISHU, Somalia – A total of forty (40) Individual Police Officers (IPOs) from Police Contributing Countries to AMISOM will be leaving Somalia this week, after the end of their tour of duty. The officers from Ghana, Kenya, Nigeria, Sierra Leone, Uganda and Zambia received medals and certificates of service at a ceremony presided over by the Acting AMISOM Police Commissioner, Christine Alalo. “Your contribution to providing the Somali Police Force with the international policing standards is worthy of note and appreciated. You went over and beyond your call of duty and for that we commend your efforts,” Ms. Alalo said to the police officers, who trained and mentored the Somali police officers in Mogadishu and outstations. “We are grateful for the support and collaboration we received from our Somali counterparts. We are leaving behind best-policing practices comparable to international standards. We are confident that our Somali counterparts are better placed in terms of handling suspects, investigations, conduct and discipline,” noted Inspector Alvince Osura from Kenya. Present at the ceremony were senior AMISOM police officers, among them the Police Coordinator for Reforms and Restructuring, Maxwell Chikunguru, Police Operations Coordinator, Daniel Ali Gwambal, and the acting Police Training Coordinator Leon Ngulube.